It’s no secret that anytime God is working, the Devil will be trying his best to hinder the good that’s being done. John 10:10 tells us that the Devil comes to steal, kill, and destroy, but that Jesus came so that we can have abundant life. Now, as Christians, we know that Jesus has already won the battle between good and evil, conquered the grave,and defeated Satan. However, that doesn’t mean that our time on earth will be without hardship, frustrations, and trouble. John 16:33 makes it very clear. Jesus says, “In this world, you will have trouble. But take heart! I have overcome the world!” Now, knowing what we know, we have a responsibility. That responsibility is to be on the look out, to be on guard, and to be ready for the Devil’s attacks. When we resist the Devil, he will flee from us (James 4:7) and if we put on the armor of God, we will be ready when the Devil tries to interfere with our willingness to be fruitful vessels for the Lord. 10 Finally, be strong in the Lord and in his mighty power. 11 Put on the full armor of God, so that you can take your stand against the devil’s schemes. 12 For our struggle is not against flesh and blood, but against the rulers, against the authorities, against the powers of this dark world and against the spiritual forces of evil in the heavenly realms. 13 Therefore put on the full armor of God,so that when the day of evil comes, you may be able to stand your ground, and after you have done everything, to stand. 14 Stand firm then, with the belt of truth buckled around your waist, with the breastplate of righteousness in place,15 and with your feet fitted with the readiness that comes from the gospel of peace. 16 In addition to all this, take up the shield of faith, with which you can extinguish all the flaming arrows of the evil one. 17 Take the helmet of salvationand the sword of the Spirit, which is the word of God. It’s amazing how quickly the Devil will creep his way in if we let him. 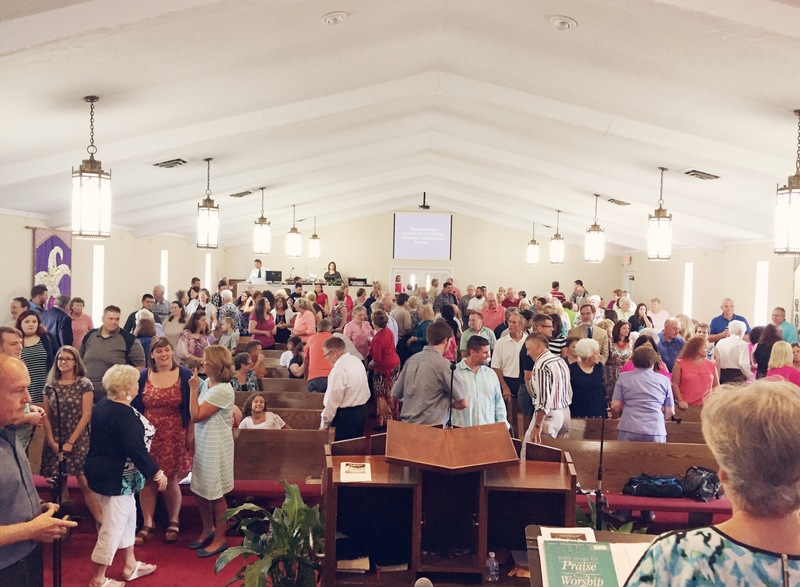 A booming, growing church with people getting saved left and right? A blooming women’s ministry with a core group of faithful leaders who are unified in purpose and heart for Christ and other women? A growing children’s ministry with little lives being shaped for Christ? A new marriage with two imperfect people trying to keep the Lord at the center of everything they do? A mission team with a goal of taking the good news to the other side of the world? The list could go on and on and on. Where there is good, the Devil will try to stop it, and we have to be fixated on Christ so that we 1) realize it when it’s happening 2) look to Christ and rely on Him to get us through the hard times 3) point others to Christ in the way that we handle hardship. As Christians, people are watching us. Some people are just waiting and hoping for us to fail so that they can confirm their suspicions of how “hypocritical” we are. The truth is that we are held to a higher standard, and while it’s easy to be a shining light for Christ in the easy times, our true character really shows in the hard times. I will be the first to admit that keeping these truths at the forefront of our minds constantly is hard. It’s easy to slip into a defeated slump, to forget that we are called to be set apart, and to let the Devil begin to steal our joy. When I was in high school, I heard a message that really resonated with me and has been a reminder for me all these years. It was about how to keep ourselves from becoming vulnerable and easily affected by the Devil’s schemes. Using the acrostic “HALT,” our teacher explained four things to never let ourselves become excessively. When we allow ourselves to become too hungry, angry, lonely, or tired, we open the floodgates for Satan to creep in and attempt to destroy our character and cause us to sin. Remembering messages like this, calling Scripture to mind, and praying relentlessly are the best ways to fight back against the Devil’s attacks. This week, I am praying specifically for you, my friends, that you would be wise enough to see the Devil’s attacks coming, that you would be strong against the lies he is trying to make you believe, and that you would be a good example of Christ even in the midst of extreme hardship. What’s on my heart today? A message from our new pastor. Calvary has been thrilled to welcome Pastor Jack Homesley and his wife, Kim. It’s not even been a week since he became our pastor, and God has already used him in an incredible way at our church. That’s a pretty simple truth, right? But, it’s so profound. It’s true for so many things- from the way you treat your personal possessions, to how you care for your own body, to how you maintain your relationships. Help them to see how wrong they are, God. Make them learn their lesson and not treat me like this again, Lord. It’s so easy to judge people by how far they still have to go instead of appreciating how far they’ve come. If we pray positively for them, God changes our hearts, too. I’m so excited for the work that’s begun at Calvary. I plan to share lots of the messages that really touch my heart, so stay tuned! I love learning and growing in Christ with you! If you’re like me, you’re always looking for ways to make your home extra cozy for the holidays. Fall decorations are some of my favorites (second only to Christmas). When I stumbled across this great list of darling fall printables, I could hardly wait to get one in a frame and into my living room. 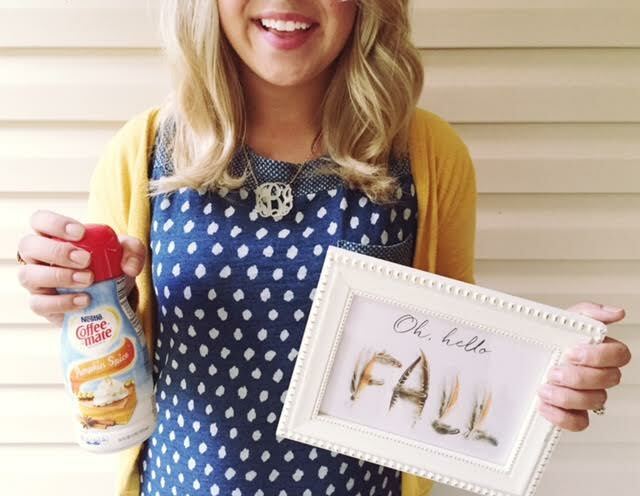 The fact that when I got home my sweet husband had stopped by the store and got me a bottle of pumpkin spice creamer (my favorite! because I’m a shameless basic white girl) just sealed the deal. FALL IS HERE, YA’LL. EMBRACE IT! Wow! What a fun-filled weekend! On Friday afternoon, I headed up to Raleigh, N.C. for a friend’s bachelorette party and got to see two more friends on the way home the next day. I was so glad I was able to squeeze in time with all three friends! Driving home, I had a lot of time to think and pray and one thing that just kept coming to mind was what a gift friendships like these are. When I went to college, I remember praying over and over again that God would surround me with Godly, faithful girlfriends, and that’s exactly what He’s done over the last six years. 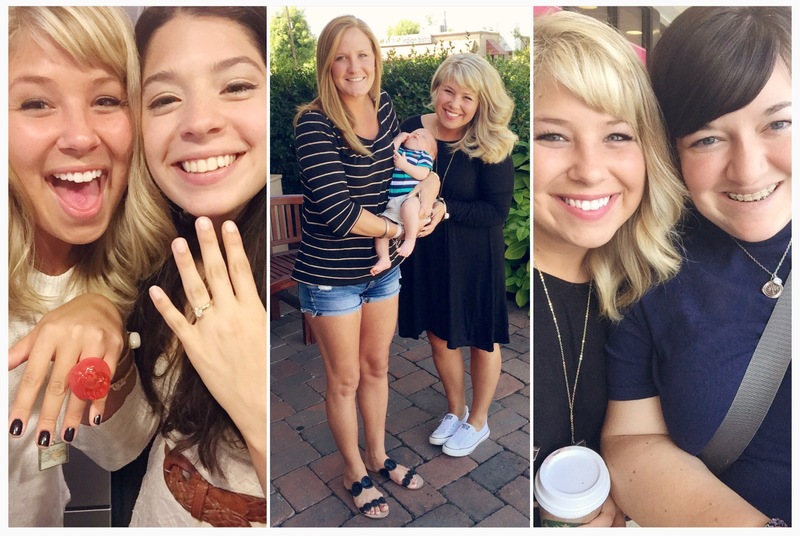 These sweet friends and I are all in totally different seasons of life: Valerie (left) is getting ready to get married, so she’s enjoying the busy, exciting season of preparing to become a bride. Kayla (middle) and her husband just had their first baby, so she’s enjoying the sweet season of motherhood and newness that comes with bringing a precious life into the world. 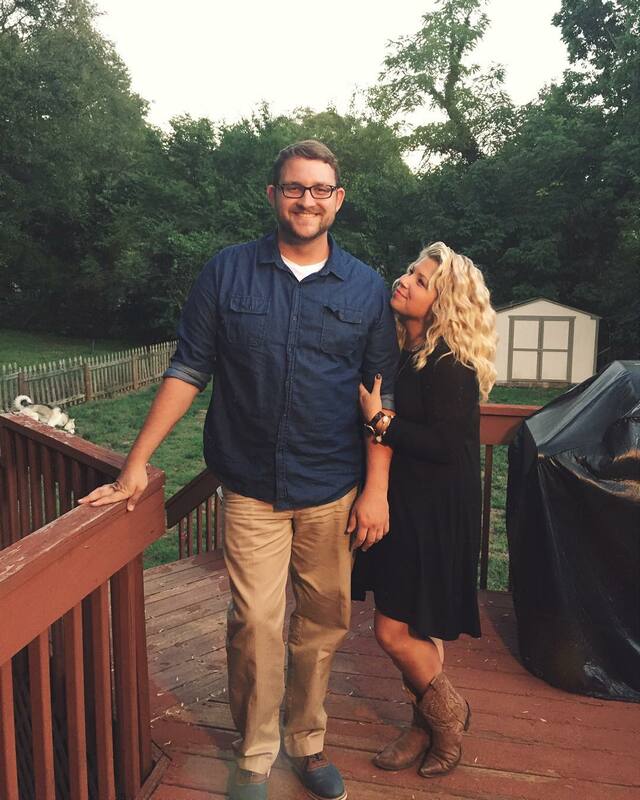 And, Amanda (right) has been married for several years, and is currently living in Wake Forest, N.C. while her husband finishes seminary, so she is embracing the adventure God has set before them as a couple and learning to bloom where she’s been planted. I love being able to share the milestones of life, rejoice together in the joyful times, and encourage each other through the hard times. It’s such a gift from God! Learning from one another, sharing wisdom and experiences with one another, praying for one another… .it’s priceless. It’s fall, it’s fall, it’s the best time of all! I love any and everything related to fall, from pumpkin spice lattes (okay, let’s be honest, I love pumpkin anything), to the cool, crisp air, to the beauty of the leaves falling, to the county fairs and festivals and pumpkin carving… and fall nail color is no exception. These are a few of my favorites! What’s your favorite fall nail color? I’d love to try it out! I think about my wedding day all the time. It was kind of a blur, very overwhelming, but so very special. I would be lying if I said that it was perfect and there is nothing I would change if I could go back, but despite all the little things that went wrong, it was still the best day of my life because it’s the day I became one with the man God made just for me. It’s hard to believe that it’s almost been a whole year since I walked down the isle wearing the most beautiful dress I’ll ever own. What a day. For those of you that don’t know, the church that we got married in burned down just a few months ago, making us the very last people to ever get married there. When the church burned, all I could think about was that our (future) little girls will never get to see where their Momma and Daddy got married, and it’s also the church where Grayson grew up. Thankfully, we have pictures and precious memories, because they last a lifetime and now, more than ever, they are worth more than gold. On the front doors of the church, we had two of my great aunt’s wreaths with big red bows. 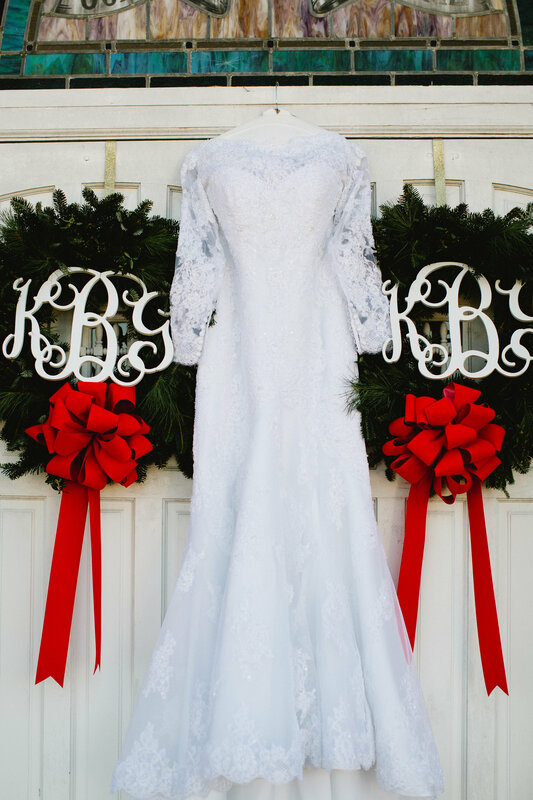 My aunt lives on a farm in a small town nestled in the mountains of North Carolina and it was so special having these fresh, fragrant wreaths as the first decorations people saw when arriving at our wedding. I also have to mention that Grayson stood at the doors and welcomed each and every guest as they arrived to our wedding and I didn’t even know it until after the fact. I love how he took the initiative to add another personal touch to our day. Everyone who knows me knows I love anything monogrammed, so it was only fitting that the doors be adorned with our initials (I ordered these unfinished monograms from Jane.com and spray painted them white, only $13.99 each). My wedding gown is a treasure in itself. It would take me all day to explain how I found it or even begin to describe the precious memories I have with my Mom the day I put it on for the first time, but I’ll just say that it is exactly what I’ve always wanted, down to every last detail. Another special part of our wedding weekend was spending the night before my wedding with all my best friends. We sat up talking all night and I wouldn’t trade that time of fellowship with them for anything in this world. 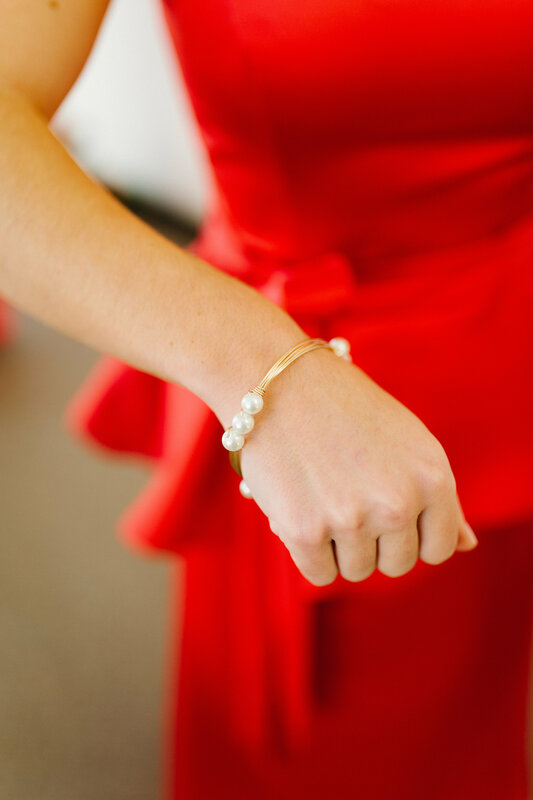 As a gift, I gave them monogrammed satin robes to get ready in the day of the wedding and pearl Renmen Abonde bracelets. It was so special seeing all my girlfriends wearing a little piece of my ministry so beautifully on such a special day. 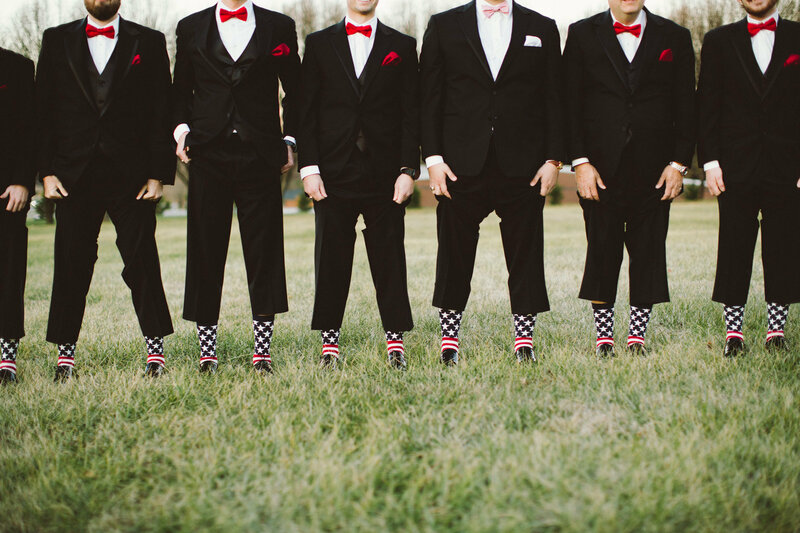 One special touch Grayson was excited to incorporate into our wedding party’s attire were the American flag socks his groomsmen proudly sported. It was such a fun, festive way to bring out something Grayson loves- our country- and it still matched! Both of my grandparents passed away before my wedding, and I knew I wanted to do something special to honor them on my wedding day. 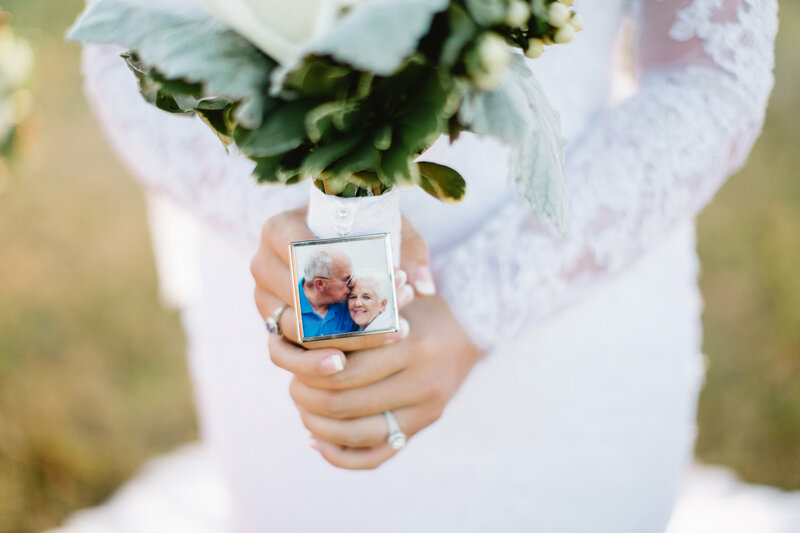 I considered several options, but I’m so glad I chose to add a photo charm to my bouquet with one of my favorite pictures of them. I loved having that sweet reminder of the kind of marriage I hope Grayson and I have. 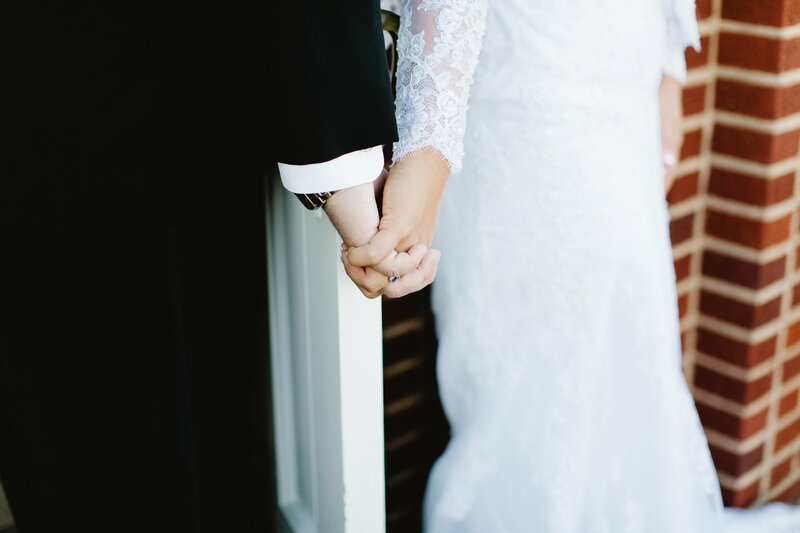 Our wedding day was completely covered in prayer, which is another reason that the whole day was so special to me. Grayson and I chose not to see each other before I walked down the isle, but we did pray together. He stood on one side of the door and I stood on the other, and we took turns lifting each other’s name up to our Father. There aren’t even words for what this few minutes meant to us. It was such a peaceful, precious reminder of the magnitude of the promise we were about to make before God and everyone we love. 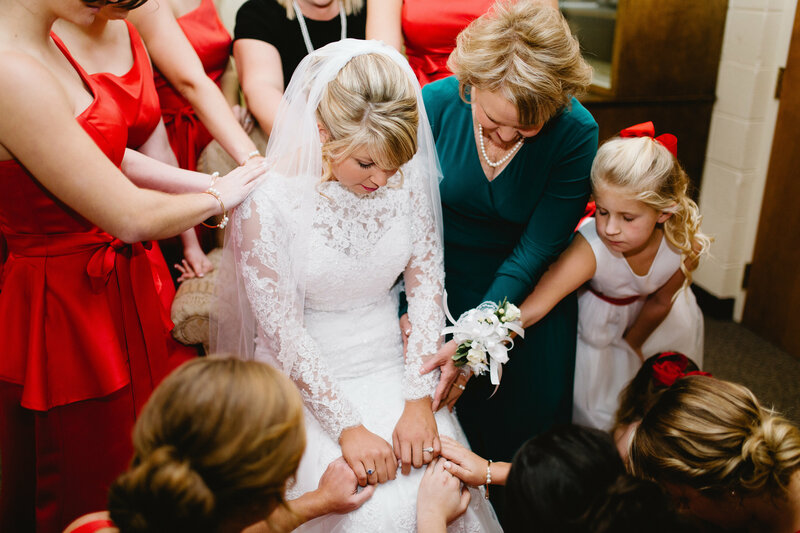 Right before it was time for the wedding party to go line up, my bridesmaids, flowergirls, mother-in-law, and Mom laid hands on me and prayed over the celebration that was about to take place. My deepest desire was that our wedding be a true worship service, and that it would point everyone there to Jesus above all else. This time of prayer truly set the tune for that, and I’m so glad we paused in the middle of the chaos to call on His name. 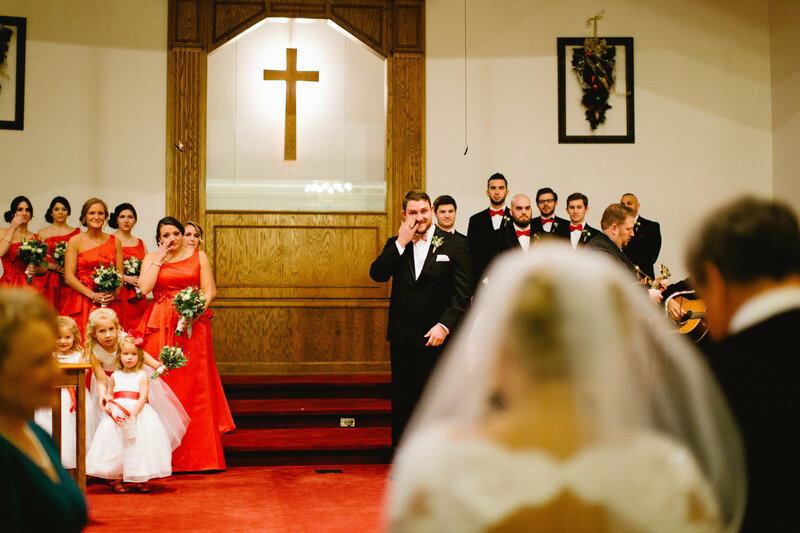 I can’t even really talk about walking down the isle to my groom without crying. My entire life, I always thought that my Paw would be there to walk me down the isle, but when he passed away my freshman year of college, that dream was shattered. I didn’t have a peace about anyone walking me down the isle, although I am close to several wonderful, Godly men. A few nights before my wedding, the pastor who married us (who has watched me grow up, served as my youth pastor, did our premarital counseling, has mentored me over the years, and always been like a daddy to me) called me and asked if he could come over to our house to talk. Three days before my wedding day, he sat at my Mom’s kitchen table with me, Grayson, and my Mom, and had big tears in his eyes as he asked permission to walk me down the isle. It was one of the sweetest gifts anyone has ever given me, and I have never been more honored than I was to walk down that isle on his arm. It’s a privilege his only daughter so graciously shared with me and me alone, and I know without a shadow of a doubt that it’s exactly what God intended. So, the reason you see my groom standing at the altar waiting on me with no pastor, is because that pastor filled two very important roles that day, and I’m forever grateful for both. Our ceremony was special for the obvious reasons- saying our vows, “I do’s,” and sharing our first kiss as husband and wife- but other special parts of it were Grayson singing a song called “Better Today” by Anderson Coffey and our congregation standing and singing “In Christ Alone” together in worship. To this day, when we hear that sweet hymn, my husband and I share a knowing look and we get to relive just a little snipit of our wedding day all over again. 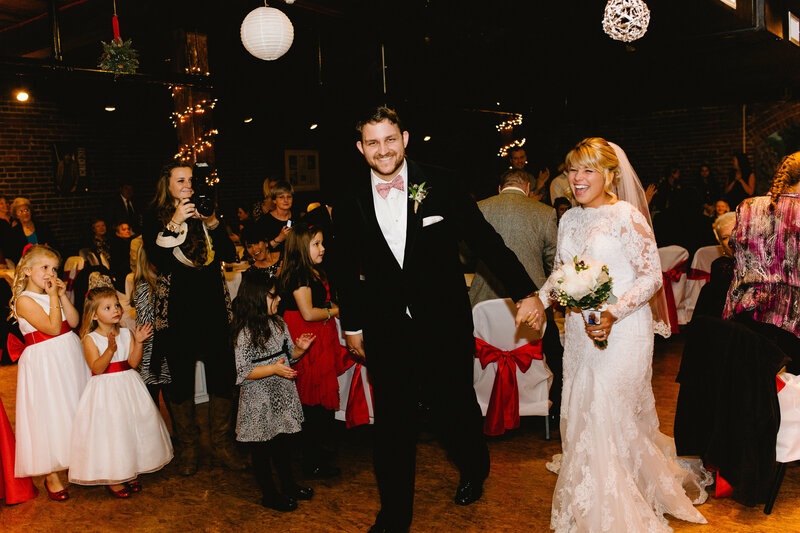 We chose to walk in to our reception venue and be introduced as husband and wife to the song “You’re the One that I Want,” from Grease, which was so fun (and Grayson’s idea!). 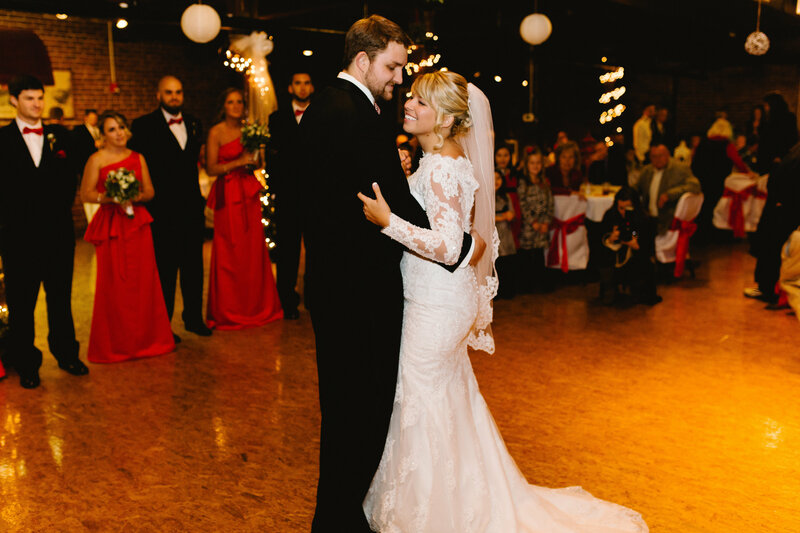 We also wanted a way to honor his parents, so we chose “You’re the Inspiration” by Chicago, which was their wedding song, as our first dance. 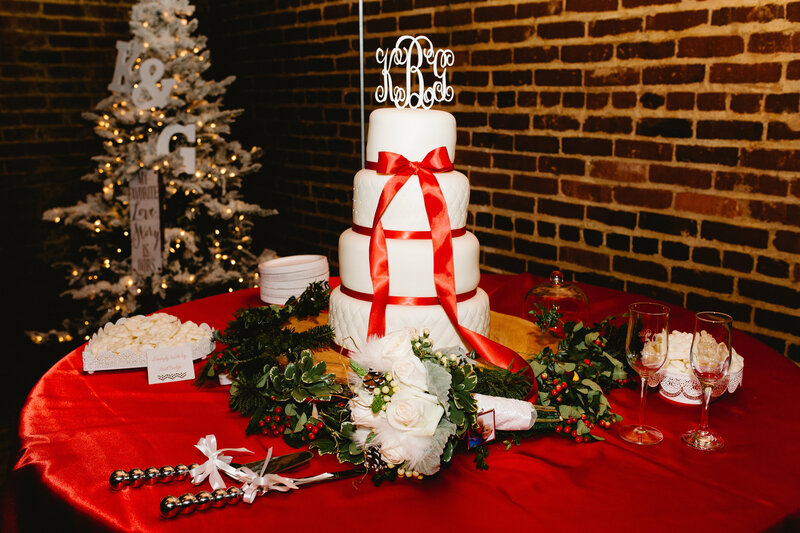 Our wedding cake was made by a good friend of Grayson’s family, and it was just as delicious as it is pretty. We toasted out of the same glasses that my grandparents used for their 50th wedding anniversary, and there were a thousand other little decorations and sentiments at our reception that added that special, personal touch. From my great aunt’s famous mints, to sparkling Christmas trees dotted around the room, to our decision to have a “dessert first” dinner so that our guests could satisfy their sweet tooth while waiting for us to finish pictures, I loved every little detail. The last thing I’ll mention (although I really could go on forever) is the dancing. 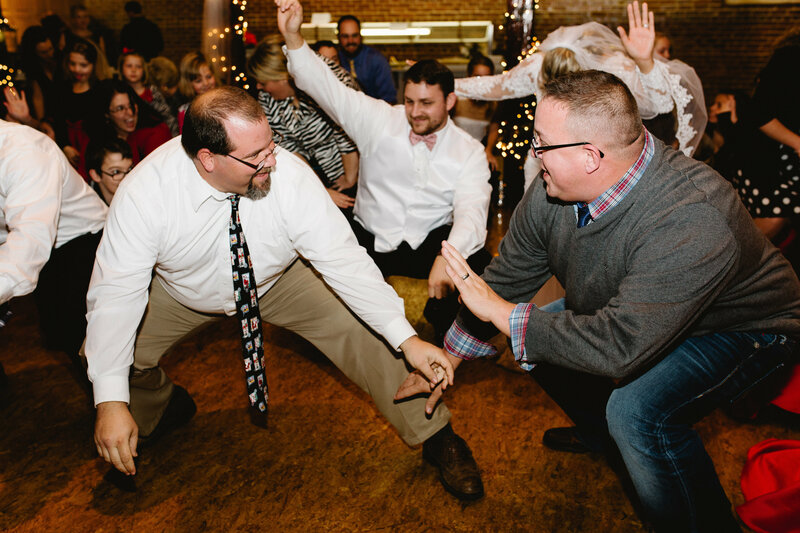 Grayson and I both wanted a fun, upbeat reception full of dancing, and we knew from experience that this only happens if the bride and groom dance, too! We danced every dance and had the time of our lives with all of our favorite people. Seriously… the most fun. We left our reception totally and completely exhausted… but oh, so happy. Can we just talk about how dreamy this guy is? I don’t know how in this world the Lord saw fit to bless me with this gem of a man, but I sure am glad He did. My constant source of laughter, my warm embrace after the hardest of days, my voice of reason, my adventure partner for life… this man is the sweetest gift in my life. I did my hair with a double barrel curling iron that I picked up at Walmart for like $15. I love using it anytime I’m in the mood to change things up a bit. My dress is from Caralase Boutique via Jane.com (only $17.99). My cowgirl boots are from Watsonatta Western World (Boone, N.C.) and they’re perfectly broken in and so comfortable. They were a birthday gift from Gray about 3 years ago and I’ve worn them so much over the years. The tortoise watch I’m wearing is Michael Kors and the pretty little handmade bracelets are Renmen Abonde (of course!). It’s hard to believe that it’s been 14 years since tragedy struck our nation. The image of the planes hitting the World Trade Centers and the Pentagon is so devastatingly ingrained in our minds, that it seems like all someone has to do is say “9/11” and the image is there in our minds, hitting us all over again. It was such a heartbreaking, cowardly act, and truthfully, there are no words to really encompass the kind of evil that took place that day. That was the first time I saw the planes crash into the buildings. I saw it another thousand times or so before the day was over, and even more in the weeks and months to come, but I’ll never forget the first time. I had so many questions, but even in my young heart, I could feel the hurt of our nation. My Mom picked me up early from school that day, much like many of my classmate’s parents did, and we went to a prayer meeting at the old Charlotte Colosseum led by Pat McCrory. 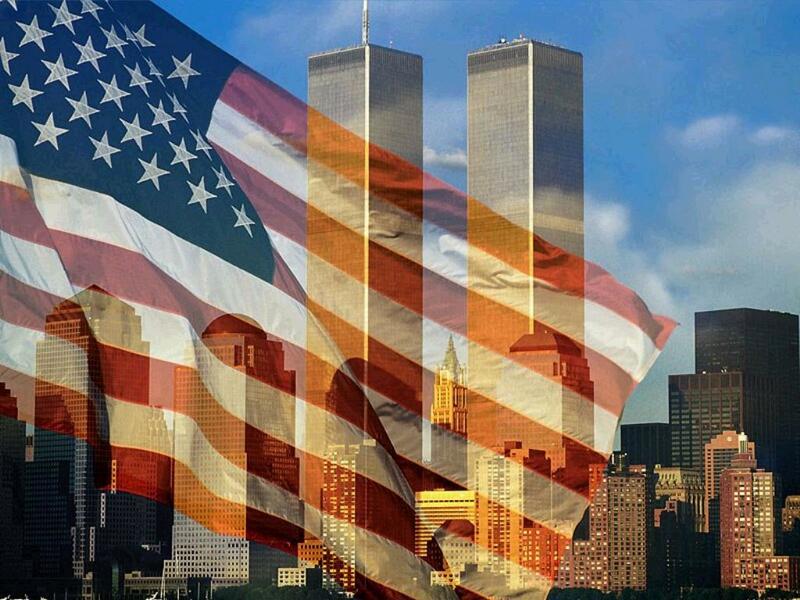 We mourned the loss of precious lives together with complete strangers, unified by our love for our country. Where were you? Are there any specific ways that I can pray for you? Do you know survivors or families of the victims? I would love to know your stories and pray for you. These days, it seems the only way to communicate is through text or email. Even good old fashioned phone calls are becoming more few and far between. However, I am (and have always been) a firm believer in the power of a handwritten note. When you write someone a letter, you’re giving them a gift. You’re giving them a piece of your heart that’s tangible that they can keep forever. I have saved so many notes that people have given me over the years and I love going back over them again and again. It seems like I can almost hear them saying the words they’ve written, I can imagine the hand gestures they would be doing if they were right in front of me, and I get something new out of their letters each time I reread them. What a gift! I encourage you, this week, to take the time to sit down and write someone a note. It doesn’t have to be long, it just has to let them know you’re thinking about them. You might just make someone’s day! I usually buy monogrammed note cards from Jane.com, pick up a pack at Target, or find cute ones at TJMaxx, but here are a few of my favorite little notecards I’ve found for sale online. Print your own adorable polka dot notecards using the tutorial found here! And most recently, I’ve been drooling over all the beautiful handmade stationary designs by Hello Sundays Paper, which is out of Santa Barbara, California. I remember waking up early at the beach as a child, the first thing I heard was the crashing of the waves through the cracked sliding glass door to the hotel’s balcony. The first thing I saw was my Momma, wrapped up in a robe, sipping coffee and reading her Bible on the balcony, glancing up occasionally at the beach with such awe. Look what Jesus did. Look how massive. Look how constant. That’s one of my best memories, and it’s funny, because the older I get, the more I think about times like those. 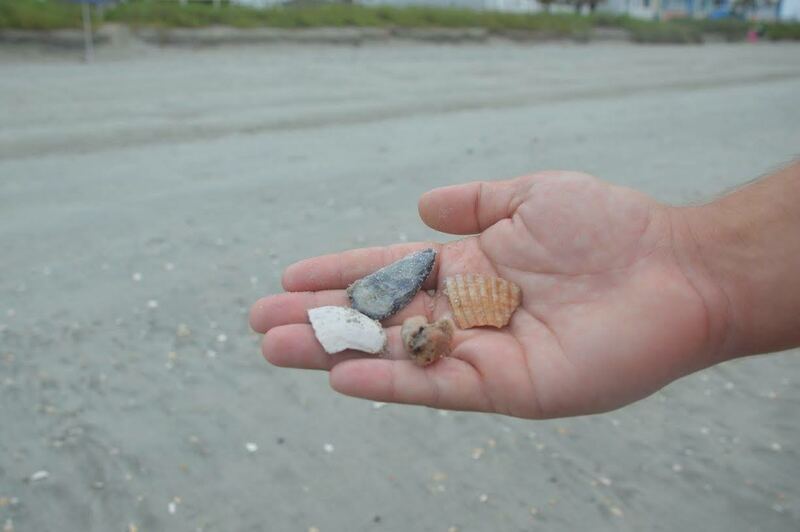 No matter how far I wanted to walk down the beach or how many sea shells I tucked into my Momma’s hand, she always obliged my desire to find “just one more.” I’m so thankful she always encouraged my excitement, no matter how big or how small my passions might have been. My favorite thing to do at the beach was always look for sea shells. To this day, I still call them “she” shells, and I have a large collection of the thousands of them I’ve picked up lovingly over the years. I still love looking for shells, and this weekend, I had the opportunity to do just that. Isn’t it funny how we always look for those perfect shells? The unbroken sand dollar, the starfish that still has all five legs, the uncracked conch… What is it about us that makes us think only the seemingly unscathed shells are beautiful? When I was walking down the beach staring at the broken shards of what were once probably beautiful shells, before they’d been crushed and tossed and jarred and cracked by the powerful force of the ocean, I couldn’t help but thank my Savior. Oh, you’re broken, I don’t want you. Oh, you’re damaged, I don’t want you either. Look at that big crack! I can’t use you! I’m so glad God doesn’t look at us that way. He loves us so much that He sees beauty where the world sees brokenness. He knows that the cracks we’ve earned in our hearts by being tossed around by the world have given us character, molded us, and often times, led us straight to Him. What you think are flaws make you beautiful in your Father’s eyes. What a gift.